During Daffodil Days at Rhode Island's Blithewold Mansion, Gardens & Arboretum, you'll see more than 50,000 daffodils growing in gardens and along woodland paths. The Daffodil Days event runs during the month of April in 2017, and after the prolonged winter we've had, these yellow blooms will be a welcome sight. For an added treat, enjoy Afternoon Tea in the mansion's dining room Tuesday through Friday at 1 or 3 p.m. between April 11 and May 5 during the springtime celebration (advance reservations required). Back this year, enjoy live jazz and a complimentary cocktail or lemonade during special Daffodils at Dusk after-hours events from 6 to 8 p.m. on Fridays April 21 and 28 and May 5. These evenings will also feature an outdoor scavenger hunt for children. Regular museum admission fees apply. I toured Blithewold on a summerlike weekend in April of 2009, and I was enthralled by the sunny blooms and the scenic vistas as I strolled this lovely estate on Narragansett Bay in Bristol, Rhode Island. The gardens at Blithewold reflect both the passion of two generations of women who lived at Blithewold and the vision of landscape architect John DeWolf. Blithewold's gardens and tree specimen-dotted grounds are splendid year-round, but Daffodil Days are a truly glorious time to visit. 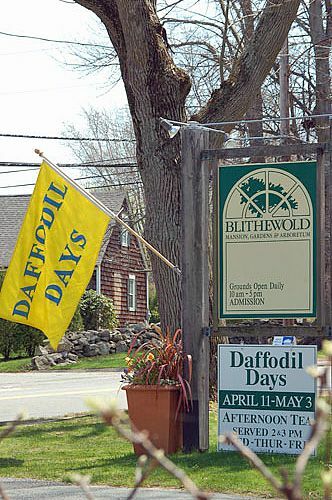 For information about Blithewold's Daffodil Days, call 401-253-2707. Love Daffodils? Don't miss the Meriden Daffodil Festival: a free annual event in Connecticut. See 50,0000 sunny blooms during the annual Daffodil Days at Blithewold Mansion, Gardens & Arboretum in Bristol, Rhode Island.